Sift flour and baking powder into a large mixing bowl. Add sugar and salt and blend well to combine. Beat eggs until light and fluffy, add yogurt and stir to combine. Add the rest of the wet ingredients and lemon zest, mix well to combine. Add wet ingredients to the dry ingredients and fold gently to combine (don't over mix). Scoop into a prepared 18 cup muffin pan. Sprinkle with super fine sugar and bake for 15 to 20 minutes. Thanks, Amee. They're so so good!! This sounds wonderful, Mia. We love lemon in cakes or pies. Is super fine sugar granulated or powered confectioners? These look so good. Will be trying them soon! Anonymous - I use powdered sugar or granulated sugar. I'm making those for sure. Lemons are my number 1 fav then next comes Healthy Dark Chocolate!! It looks like there is something that was inserted on top...A lemon slice I assume. But it doesn't look burnt. Was it inserted right after baking? Anyone know? Thanks. 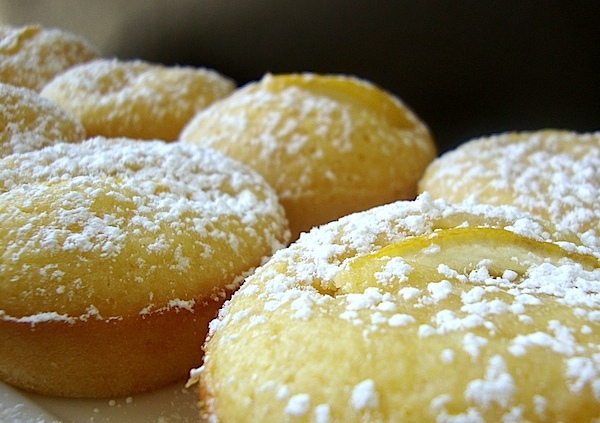 I make these lemon cakes twice I did everything and followed the directions to the T. Unfortunetly both times the mini lemon cakes Did Not Rise!! Did anyone else make these and have the same problem???? If not please let me know what you did so I know for next when I want to make them. Thanks.